Senator Broderick would have given anything for a mulligan. . .
Congratulations to the American team for a great victory in last week's President's Cup. I've never been one to watch a lot of golf on television, but I tuned in a few times for this one, since it was held at Harding Park in San Francisco, where once upon a time a played a few rounds myself. What's the Civil War connection? Oh, I'm so glad you asked. This area—what is now Harding Park and Lake Merritt—was also the scene, 150 years ago, of one of the country's great, antebellum showdowns pitting pro- and anti-slavery forces against one another in murderous rage, fully a month before John Brown's raid at Harpers Ferry. Every lie was in the rough back then. In a more famous scene of Southern honor avenged, Senator Charles Sumner eventually recovered from the brutal attack against him in the Senate by Preston Brooks of South Carolina. 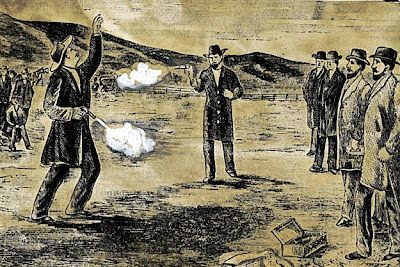 But California Senator David C. Broderick would not survive his showdown with former Chief Justice of the California Supreme Court, the pro-slavery David S. Terry, along the shoreline of Lake Merritt. Indeed, Broderick became the first sitting senator to die in a duel. Broderick, and the other California senator at that time, William Gwin, were both Democrats, but represented the two sides of the Democratic coin that would so severely split the party on the 1860 ballot (even more so, the California Democrats had a faction that was decidedly anti-slavery, with Broderick its chief representative). Terry, a close political ally of Gwin's, denounced Broderick as a wayward Democrat who pledged allegiance to the "wrong Douglas" (Frederick Douglass, the black Republican, rather than Stephen Douglas, the Little Giant of the Lincoln–Douglas debates). Broderick weighed in with some choice comments in return, effectively calling Terry a crooked judge, and a "miserable wretch." Read all about it in this brief entry by the Senate Historian. Fighting words, you say? Indeed. Terry insisted upon a public retraction. When that was not forthcoming, he demanded satisfaction at ten paces, and Broderick accepted the gentlemanly resolution. The San Francisco Bulletin wrote on that day, "We cannot refrain from indulging, once more, in some expressions of sorrow and disgust at the barbarous practice of dueling which still seems to be tolerated among us." At nearly 7 o'clock that fated Tuesday morning, every other procedure of the awful scene having been adequately performed according to the articles, Mr. David Colton, the second of Mr. Broderick, upon whom the painful duty had been imposed, put the dread question, preliminary to the "word," "Gentlemen, are you ready?" Instantly the response came from Judge Terry, "Ready," in firm, natural tone of voice, and without play of feature or movement of muscle. Mr. Broderick did not respond at once, but again occupied a few moments in adjusting his pistol. This done, evidently to his satisfaction, he spoke the word "Ready," accompanied by a gesture and a nod, as of assent to Mr. Colton. Then came the "word," "Fire-one-two." The pause between the words was as that between the striking of the hours of "the cathedral clock," as a critical observer described it. Almost at the "one," Mr. Broderick fired. The ball from his pistol entered the ground just nine feet from where he stood, in a true line with his antagonist. Judge Terry fired before "two" had been uttered. A slight show of dust upon the right lapel of Mr. Broderick's buttoned coat gave token where the ball had struck. Reportedly, Broderick's death made him a martyr in the nascent anti-slavery movement in California, and further polarized the growing Northern and Southern factions in the state. Terry was arrested and tried, but eventually acquitted, freeing him up to put his money where his mouth was, and take up arms for the South. Justice Terry, the younger brother of Benjamin Franklin Terry of Terry's (Texas) Rangers fame, would go on to serve in Confederate forces, was wounded at Chickamauga, then spent the balance of the war in the backwaters of Texas. He survived the war, but his sense of honor led to his untimely demise nonetheless. Thirty years after he killed Broderick, Terry accosted an Associate Justice of the United States Supreme Court in Lathrop, California, and was fatally shot by the judge's body guard. For some good photos of the Broderick–Terry duel site, go here. San Francisco's Anchor Steam brewery has an excellent account of the duel, including a full length version of O'Meara's report here. A recent article in the San Francisco Chronicle remembered the event. This blog on San Francisco's western-most neighborhoods commemorates the duel on a page entitled "Guns and Golf." Sharlene Perez de-cluttered her closet and ended up depositing $130,000. Read all about it in the L.A. Times. I wonder how much I can get for my mint condition Evansville Triplets rain poncho? You can't get those anymore—the independent Otters supplanted the Triple-A Detroit Tigers farm club long ago. I am now taking bids. Sharlene pulled down a box of guns from the closet, nearly forgotten there after the death of her husband, who had received them as a gift. They were Navy Colts with ivory handles, presented to Colonel William C. Brown, elected to command the 35th New York Infantry in the Civil War.